Our school is delighted to have exclusive access to the Astro-Turf pitch which is located to the side of the school, adjacent to the school hall. The Astro-Turf is a community facility which was fully upgraded a number of years ago through the efforts of the Ransboro Development Association and it now has an excellent all-weather surface. The pitch is used on a daily basis during the school day. 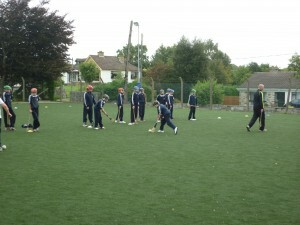 The senior pupils in fourth, fifth and sixth classes use different areas of the Astro-Turf pitch during break times. The pitch is occasionally used by classes for outdoor PE lessons. It is also regularly used by outside coaches who visit the school for coaching lessons at various times of the year in sports such as Gaelic football, hurling, rugby, tennis etc.